I love to create with wool, blending imagination and skill to make items of beauty and utility from the fabulous fleece of our very own native breed sheep. This wonderful raw material - sheep’s fleece - was the inspiration for founding All in a Spin when I left my job as a college manager in 2011 to move to Wales. I love to teach and encourage others, to share my skills and knowledge. My expertise has been gained both through learning from people whose own skills were passed on down the generations and by studying with masters of their craft from around the world. Whatever your level of experience, here at Pen Y Caeau Farm you can learn to spin, learn to weave or learn to dye something beautiful and unique, or improve your skills to advanced level. In association with Agored Cymru and Creo Skills, I have developed accredited courses in hand spinning at Level 1 (beginners) and Level 3 (A Level standard). These unique, nationally recognised courses are available exclusively through All in A Spin. I also deliver Agored Cymru accredited units in Weaving with a Multi Shaft Loom at Level 1 and Level 2 (GCSE standard). Do you have sheep and no time to spin their wool? Then why not commission me to turn that fleece into very special yarn. Whether it's super-chunky Herdwick for floor rugs or luscious alpaca for lace shawls, I can turn that fleece into the yarn of your dreams. Continuing a tradition going back to the 1600's, my husband Brian and I farm high in the Black Mountains near Crickhowell. Our philosophy is to tread lightly on the environment, with sustainability and animal welfare at the heart of our farming practice. 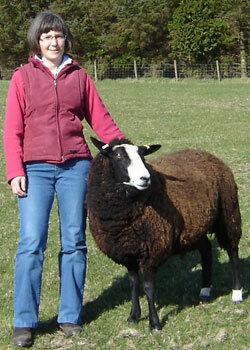 We raise predominantly native breed sheep –our champion Clun Forest flock and Zwartbles from Holland. They provide the fine quality wool for my classes. You can even combine a break in the Brecon Beacons National Park and all it has to offer with one or more of my spinning, weaving or textile craft classes. Individual packages can be arranged. Or try a new experience - working the sheepdogs, 24 hour hands on lambing or learning about sheep husbandry. Because without the sheep, there would be no fleece! So whether you are seeking to learn new skills or just want to experience something different during your stay in the ‘Park', I look forward to meeting you soon.